Late last year, we covered the opening of bids for California’s Demand Response Auction Mechanism, or DRAM -- the state’s first big attempt to bring distributed energy resources into service for the grid, from smart thermostats and EV chargers to behind-the-meter batteries and commercial-industrial load control. Now the first round of winners is in -- and as expected, it’s an eclectic mix. Late last week, California’s big three utilities announced contracts with nine different companies, each of which managed to beat the competition in the first round of this first-of-a-kind pilot project. Winning bids include big commercial-industrial (C&I) projects from demand response companies such as EnerNOC, Johnson Controls-owned EnergyConnect and IPKeys/Power Partners. But they also include aggregated behind-the-meter batteries from startups Green Charge Networks and Stem -- one of the first times batteries and demand response have competed head to head to provide grid services. On the residential front, winning bids from Alarm.com’s EnergyHub and startups Ohmconnect and Chai Energy will aggregate hundreds, perhaps thousands, of homes equipped with smart thermostats. Finally, startup eMotorWerks will bring at least 1,000 smart electric-vehicle chargers into play, making it the only EV-related winner in the mix. Each winner managed to underbid a host of competitors, each with its own confidential price. Just what these prices are remains confidential, however -- which makes sense, at least in this early stage of its development. 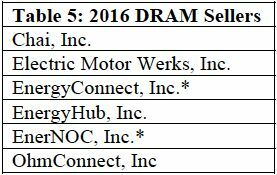 As we noted in our GTM Squared deep dive into the DRAM program, these bids represent some of the most valuable competitive information out there in the emerging world of the grid edge -- the prices at which companies think they can make the most money, yet still beat the competition, with flexible, aggregated distributed energy resources (DERs). All told, California’s three utilities have contracted for a collective 40+ megawatts of resources, according to the advice letters filed by each utility on Friday. 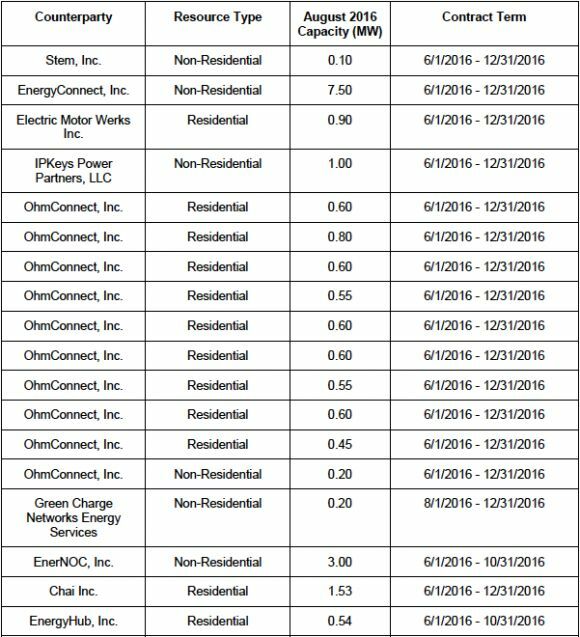 Southern California Edison contracted for just over 20 megawatts, and Pacific Gas & Electric contracted for 17.7 megawatts, more than the 10-megawatt minimum each faced, while San Diego Gas & Electric contracted for just less than 3 megawatts, exceeding its 2-megawatt minimum. Look to the bottom of this article for each utility’s list of winning companies, as well as the data available on how many kilowatts each company is providing. Some of the largest amounts of resources will be provided by established DR players like EnerNOC and EnergyConnect. 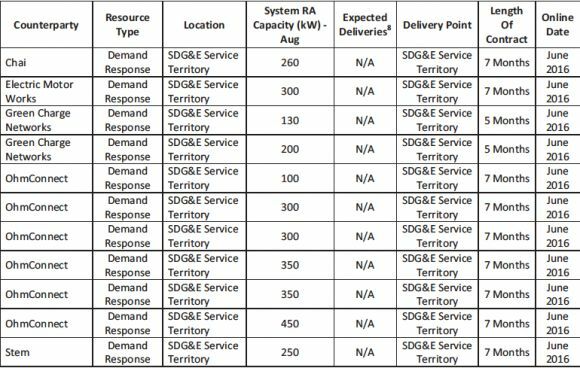 But to be fair, much of that large-scale capacity has been shifted to the DRAM from other, pre-existing demand response programs in the state, utilities’ advice letters noted. Other winning bids, however, represent the first big entry into grid markets for the companies involved. San Francisco-based startup Ohmconnect, for instance, won contracts for a collective 5.5 megawatts of DRAM capacity in nine residential and one non-residential project in Southern California Edison territory, 1.85 megawatts in six projects for SDG&E, and an undisclosed amount for PG&E. Now it’s up to each winning bidder to go out and make good on their promises. Starting in August, each will be asked to begin responding to day-ahead markets from state grid operator CAISO, as well as meeting the terms of each utility’s resource adequacy (RA) requirements. That will require them to deliver the promised amount of reliable reduction in energy consumption from their aggregated resources, for up to four hours per day and up to three days in a row, during the state’s daily peaks in grid demand. For EnergyHub, an aggregator of multiple smart thermostat brands and home services, that means “a good number of homes, and a good number of thermostat partners,” Erika Diamond, vice president of energy markets, said in a Monday interview. EnergyHub won a contract to supply half a megawatt of DRAM capacity for SCE and an undisclosed amount for PG&E. EnergyHub didn’t lowball these prices to win its bids, she added. 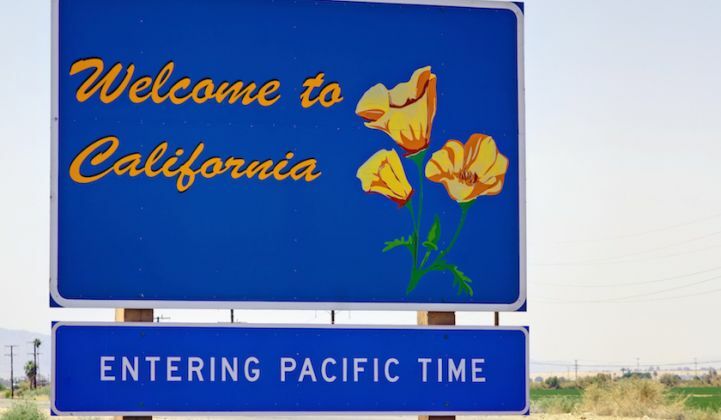 “We really believe in a long-term market for California,” which will require DRAM participants in these early rounds, as well as in succeeding rounds, to avoid making artificially low bids that could undercut the opportunities for future participants to earn a fair return, she noted. The potential for smart thermostats as grid resources could be huge, if they can reliably meet the DRAM program’s stringent duration and reliability requirements. That could require some sophisticated management of lots of homes as a portfolio to ensure that no customers find their household temperatures out of their control for too many hours at a time and to avoid other unpleasant results that could drive customers away from future participation. Growing this approach will also take some clever marketing and financial impetus to compel people to sign up. In EnergyHub’s DRAM bid, “depending on the market and the price, we are working with our partners to come up with the best type of incentive for our customers,” she said -- though again, she didn’t provide any specific details. In the case of energy storage systems from Stem and Green Charge Networks, the portfolio management challenge is a bit different. They’re not managing household temperatures. 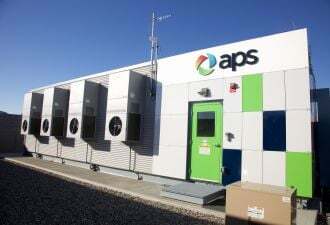 Instead, they’ve promised their customers that their behind-the-meter batteries will reduce demand charges -- a task that requires each battery to inject power when the commercial building it’s in is nearing a spike in energy consumption. Any capacity being bid into the DRAM program will have to come from extra capacity contained within those batteries, during hours they’re not being required to reduce demand charges, Green Charge CEO Vic Shao noted in a Monday interview. To solve that problem, the startup has put together a portfolio of customers with widely different load and peak demand profiles, he said. Schools, for example, are useful because they peak during early afternoon hours, and then largely sit empty in the late afternoons when the DRAM program will be asking for most of its capacity to be available. So far, however, both companies have bid relatively small amounts of capacity into DRAM’s first round, compared to their installed base in the state to date. Green Charge’s winning bids include 200 kilowatts for SCE and 330 kilowatts for SDG&E, and Stem won a 100-kilowatt bid for SCE and 250 kilowatts for SDG&E. Both companies are keeping a tight lid on how many customers they’ve signed up to reach these aggregation goals, and what financial incentives they’ve offered them to take part. In the case of eMotorWerks, the startup expects to tap more than 1,000 home EV chargers to meet its DRAM commitments of 900 kilowatts for SCE, 300 kilowatts for SDG&E, and an undisclosed amount for PG&E, CEO Valery Miftakhov said Monday. That includes both its own hardware and EV chargers from partners such as Clipper Creek, and adds up to what could well be “the largest program to date that integrates electric-vehicle charging as a grid resource,” he said. The startup isn’t saying how much financial incentive it plans to offer customers to get them to sign up for DRAM. But in a previous program, PG&E’s Supply Side Pilot, it offered them a $150 discount, in exchange for permission to stop and start charging at each home to reduce its aggregate load, while also ensuring that each customer ended up with a fully recharged EV when they needed it. It’s also looking at how spot incentives, offered to customers to help eMotorWerks meet commitments for the day-ahead CAISO markets each DRAM participant will be bidding into, could actually increase the amount of flexibility its customers will be willing to offer, he said. Here are the lists of winners from each utility.